The Buhari administration is preparing to expel the interim president of the Federal Republic of Ambazonia out of Nigerian territory. A Sisiku Ayuk Tabe plan of setting up a headquarters in Nigeria has hit the rocks following what a certain Ayaba Cho did during a visit to Nigeria. 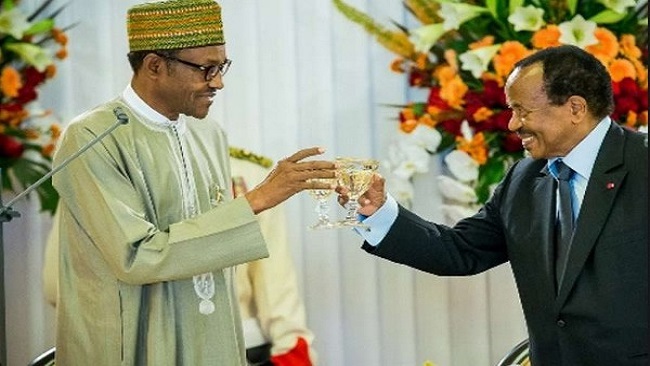 Even though Nigerian President Buhari is generally a moderate in his policy on Cameroon, and had his own misgivings about the Southern Cameroons struggle, Nigeria is among the African countries that allowed Southern Cameroonians to resettle from the French Cameroun onslaught. About 5000 Southern Cameroonians are now in the Cross River State in Nigeria. The Buhari administration will no longer let the interim Ambazonian government set up headquarters in Nigeria. Cameroon Intelligence Report gathered from security sources that Yaoundé is putting Abuja under pressure ever since Southern Cameroonians started guerrilla warfare on French Cameroun military and policing installations. The Buhari administration through a third party has ordered the interim president of the Federal Republic of Ambazonia not to visit any of the refugees camps in the Cross River State hosting more than 40, 000 Southern Cameroonians. An aide to the interim leader hinted CIR that the leadership of the Interim Government has renounced terrorism, but the activities of the Cho Ayaba gang has made matters more intractable and Abuja is saying that the interim government is not following through with the commitment. The Biya regime has handed over to Abuja over 100 new acts of terror traced to the Interim Government documented in the last two weeks. Prime Minister Philemon Yang has reportedly told President Biya that there was an urgent need to physically eliminate Sisiku Ayuk Tabe in Nigeria to stop the main instrument use by the Interim Government to gain the political momentum in Cameroon. The Biya regime has authorized its secret service through a cabinet decision under Prime Minister Philemon Yang to liaise with Nigeria to assassinate Sisiku Ayuk Tabe considered to be the principal Southern Cameroons planner of military and terrorist operations against La Republique du Cameroun. The French Cameroun team is planning to enter Nigeria soonest. An aide to President Ayuk Tabe claimed the Biya government was colluding with the United Nations and planning to kill more Southern Cameroons leaders. The UN Secretary General António Guterres was handed millions of dollars in Yaoundé by President Biya. Ever since he left Yaoundé, the UN has not commented on the crisis in Southern Cameroons. The UN Secretariat is yet to issue a statement on what was discussed between Mr. António Guterres and President Biya in Yaoundé. Yaoundé is pushing for the leadership of the Interim Government to be forced to move out of Nigeria. The understanding is that if that happens, Sisiku Ayuk Tabe’s leadership will be called increasingly into question by Southern Cameroonians. The more Southern Cameroonian political elites based in Douala, Yaoundé, Buea and Bamenda gained influence, Sisiku Ayuk Tabe will fade. The United Nations is aware that the Interim Government of the Federal Republic of Ambazonia has renounced terrorism but Biya has paid hush hush money to all those who matter deep within the UN establishment. The game changer will be for countries to recognize the interim government headed by Sisiku Ayuk Tabe and Ambazonians will be able to reverse their decline to emerge as an independent state. Eliminating Sisiku is not going to stop the train. Behind every English-speaker from the west country is a separatist. Can’t trust how the current PM or his constituents would vote in a referendum!